What kind of a village is Westergeest? Read about it below. On both sides of Westergeest there are canals, the Nieuwe Zwemmer in the north and the Stoobosser Trekvaart on the south side. They cross just past Westergeest. Because of these waters the village is often visited by pleasure crafts and is a perfect place for a canoeing trip. 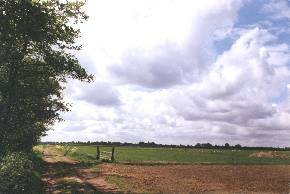 To the north of Westergeest the flat clay-landscape starts, while to the south there is the "elsensingellandschap" (aldergirdle-landscape) of the "Wouden" (woods). The nearest city is Dokkum, at +/- 10 kilometers, but the weekly shopping is also often done in Kollum or Kollumerzwaag. Many of the already mentioned pleasure crafts moor at the "Ljeppershiem", a small ground next to the canal De Zwemmer. It has a "fierljepschans" (polevault-jump), playground, swimming pond, canteen for ice and snacks etc. 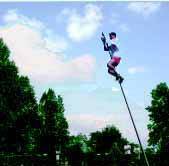 Pole vault jumping (fierljeppen) is a very famous sport of Friesland. Also located next to canal is Camping oan'e Swemmer, one of the two campings of Westergeest. The name of the other camping is "Camping de Greidp�lle", and is located at the other side of Westergeest. The Yacht haven, named "It skipjagersgat" is only just there, and new also is the tennis court of the tennis club "TC Foestrum". In the center of the village is "The Fokkema's Pleats". It used to be a farmhouse but nowadays its has a function as community centre. A lot of the activity's organized in Westergeest take place here, but its also used a lot for weddings and party's. Of course there is a locale pub, which is also the right place for snacks. The locale shop, the last one left, functions as post agency as well. Elementary school "De Bining" in the neigbouring village Triemen takes care of the primary education. For secondary education youth go to Kollum or Buitenpost. Public traffic to and from Westergeest is sometimes a problem. NoordNed lets a bus end up at the Westergeest bus stop, for train travel a station is located in Buitenpost. As in most villages Westergeest has an extensive range of associations and clubs. Already mentioned is the tennis club. Also there is a drama club, named "De b�nte Houn". 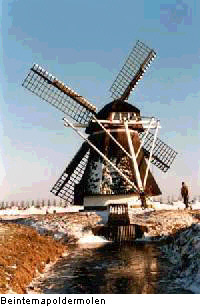 The most important is Dorpsbelang (Association for Village Interests). A lot of clubs cooperate with the neighboring villages, such as the soccer club "W.T.O.C. ", which stands for Westergeest Triemen Oudwoude Combination, and the brass-band "De Bazuin", where members are from Westergeest and Triemen. In Westergeest there are a number of monuments, the most important being the church. It was build around 1130, and may be one of the eldest brick layed buildings of the Netherlands. The church is known for its centuries old frescos (wall paintings). The building is still being used for services. Concerning Westergeest can be mentioned: the two campings, two construction companies, a car-breaker's yard, the "Koopjespark" (bargain-market), a yacht-building yard, motorcar company, a lot of companies I have forgotten, and of course, especially out of the built-up area, a lot of farming. It sjongen yn 't jong libben docht nou gjin fertriet. ja der stiet �s wente, �s hoop en �s treast. Dat wy fan alle doarpen beminne it meast. Der binn'�s gedachten nou altyd nei gien. 2 Wy binn'nergens th�s oars, as yn Westergeast. It hat foar �s bekoaring it aldermeast. Wy bliuwe altyd op �s doarpke fersot. En jong en �ld halde fan wille en fertier. Dan binn�are plakken �s meastal ta treast. Dy stiet yn it fermidden, sa dreech en sa stoer. Want f�st boppe alles giet �s Westergeast.